Along with the steady popularity of adventure-touring motorcycles, we've seen more helmet makers come out with dual-sport helmets that offer the same kind of versatility the motorcycles provide. 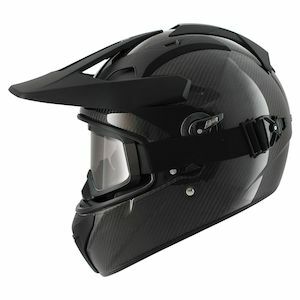 It's a simple but brilliant idea: combine the features of street and dirt helmets so the rider can choose the best configuration for the current conditions, whether blasting down the freeway or climbing a rock-studded two-track in the wilderness. Now, Shark has come out with a dual-sport helmet that packs more features into one helmet than any of its dual-sport predecessors: the Shark Explore-R Carbon helmet. We'll have a full TeamZilla Tested review of this helmet after we've put it through all the conditions it is designed to handle, but for now, TeamZilla Product Curator Ed "Buzzsaw" Wildman has been wearing the Explore-R and shared some initial impressions. "Overall, you get a real two-for-one deal," Buzzsaw reported. "You get a fully functioning street helmet and a true dual-sport helmet with a peak visor and attached goggles." The Shark Explore-R in street configuration. We don't spend a lot of time writing about gear here in the Hub, because that's not our main mission, but the unique list of features on the Explore-R is what made us consider it newsworthy. Goggles that attach to the helmet and are made to fit the eyeport perfectly are included and pair up with the peak visor for off-road riding. For street riding, you not only have the usual faceshield, which is especially easy to remove, but also an integrated flip-down sun visor. Another unique feature is the built-in neck gaiter that tucks away into its own pocket when not in use and unfolds to provide weather protection in cold or rainy conditions. When it's hot, the bamboo-treated liner has natural anti-microbial properties to keep the helmet smelling fresh even if you're sweating hard in a tough, off-road ride. The Explore-R also has a carbon fiber shell for a cool look. The Shark Explore-R in off-road configuration. "No one else even offers a helmet with all these features," Buzzsaw stated. Based on initial riding impressions, he gave positive reviews to the field of vision and the lever action on the anti-mist setting on the visor. He was less impressed with the ventilation, which looked promising but moved less air than expected. To learn more about the Shark Explore-R Carbon, see the detailed breakdown video below.